Product #45671 | SKU DRSLR400D | 0.0 (no ratings yet) Thanks for your rating! 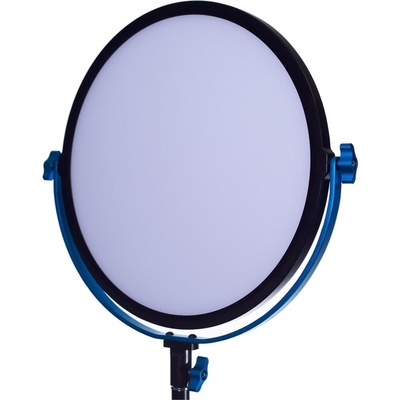 The Silkray 400 Bi-Colour LED Round Light from Dracast is a 10.23" diameter aluminium-framed fixture that weighs 2.8 lb and features 5600K daylight-balanced colour temperature to match other fixtures or ambient light conditions. Brightness is adjustable from 0-100% with the dimming level displayed on the panel's digital readout. The Silkray's 160 LEDs have a high CRI of 96+ for colour accuracy and they draw only 40W while outputting many times that number in tungsten fixture equivalence for a rapid return on your investment. Running barely warm to the touch, you can bring the light very close to the talent without discomfort and danger, and, at only a little over 1/2" thick, it can be placed in tight situations where legacy fixtures just can't go. The Silkray 400 ships with a 100-240 VAC power adapter for worldwide use, but it can also run on NP-F batteries thanks to the battery plate on the back of the fixture. A carry bag is also included.